Les Vergers, translates to the orchards and it is from orchards all over the world that Boiron collects the best fruits at the height of their ripeness. The fruit is manipulated as little as possible, to seize the optimal flavor. Boiron has perfected the process of flash pasteurization to preserve all the fruit’s natural qualities: fragrance, flavor, color and texture. The Boiron processes from: sorting, washing, crushing, blanching, sieving, de-aerating, flash pasteurization, deep freezing, and seasoning are all in place to ensure consistent quality. The ingredients list on these products is short, fruit and sugar. 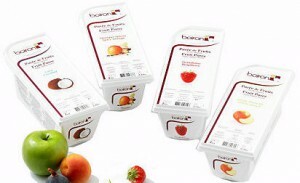 A number of the purees have no sugar added and Boiron guarantees these purees to have Brix (sugar content by percentage of mass) content between -2° and 2°, for purees with sugar added the Brix content is between -1° and 1°. The convenience of these ranges is that you, as the customer, can maintain recipes without worrying about inconsistent flavor. Great Ciao has customers are using this product in all sorts of different ways: in pastry, in confectionary, in savory dishes, and in cocktails. Whether you are making raspberry ganache, apricot mousse, green apple foam, or a black Cosmopolitan; Boiron products consistently deliver delicious fruit flavors. Click here to see recipes and suggestions at the Boiron website.